Video gaming owes a lot of its success to film, as many of the medium’s greatest games take obvious inspiration from the big screen. After all, there’s no Uncharted without Indiana Jones, and Solid Snake can’t exist without Snake Plissken being awesome in Escape from New York. That’s why it’s only fitting for us to do something to celebrate the 89th Academy Awards, that took place this past weekend. While no video game films are up for awards this year (apparently Ratchet and Clank can’t compete with Zootopia), it still got us thinking about what games could be made into a great film. Since we are a PlayStation site, we had to limit the list to games that have appeared on a Sony system, so while Gears of War would make an awesome action flick, it won’t be on this list. It’s also worth noting that we didn’t mention any PlayStation properties we’d like to see turned into a film, as we highlighted those games previously. So check out that list if you’re looking for something more Sony-centric. With that out of the way, check out our list below of 10 video game movies that we’d love to see get made! 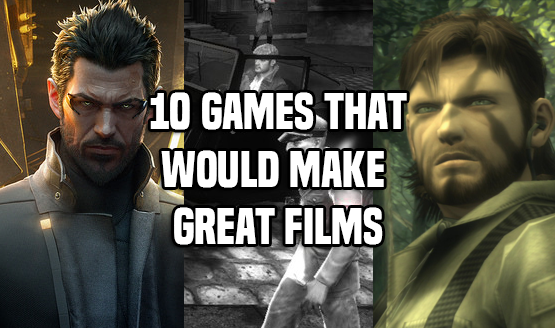 We hope you enjoyed our look at 10 video game movies that we’d love to see get made. While we only highlighted a few games that could really shine in a different medium, there are plenty of others with the potential to be something special. After all, we’ve already seen films like Mortal Kombat and Tomb Raider be sizable hits in the past, and more recently major films based upon Assassin’s Creed and Need for Speed. Let us know in the comments below which video game movies are your favorite, and what games you would like to see made into a film!